Artist, poet and Tantric guru Sohan Qadri has been immersed in painting and meditation for more than 30 years. 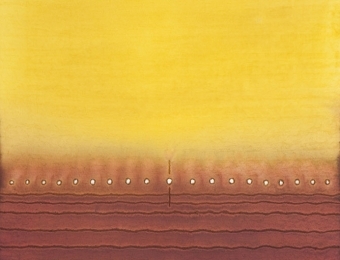 His dye-suffused paintings on meticulously serrated paper reflect his Vajrayana Tantric Buddhist philosophical beliefs. Dr. Robert Thurman, professor of Eastern religions at Columbia University and director of Tibet House, says, "If words were colors, Qadri's art would not be as essentially necessary as it is." Qadri has lived in Copenhagen, Denmark, for the last 25 years, but his career has taken him across Asia, Africa and North America. Sohan Qadri was born in India, in the village of Chachoki in the Kangra Hills, an area renowned for its tradition of Indian miniature painting. His early education consisted of practicing writing by scratching script into ash scattered on the mud floors of his outdoor classrooms and using sticks and stones to gouge, scratch and form lumps of mud into fanciful animals and human faces. At age seven he was initiated into yogic practice first by Bikham Giri, a Bengali Tantric Vajrayana yogi, and few years later he became close to a Sufi saint-like figure, Ahmed Ali Shah Qadri, whose last name he adopted. From them he imbibed an ecumenical and a deep spiritual yearning and later, as a teenager, ran away to Tibet to a Buddhist monastery in search of a higher existence. Although his family physically dragged him back home to pursue a more worldly profession, Qadri rejected a conventional life. celebrated publisher and editor of Marg magazine and an associate of the Bloomsbury Group, was the first to recognize Sohan's talent and organized his first exhibition in Le Corbusier's brand new architectural complex in Chandigarh in northern India. Soon after, Qadri departed for Nairobi, Kenya, where under the patronage of the African cultural figure Elimo Njau, he had a successful exhibition at Paa-yaa-paa, a non-profit art gallery. At the time, the gravitational pull for artists was Paris, where Sohan lived for a few years before settling in Copenhagen, invited by the Danish Ministry of Culture. In the 1970s, he, along with a group of artists and counter-culture figures, illegally occupied an old gun factory, which eventually became the famous free city Christianna. At an early age, Qadri abandoned representation in a search for transcendence. He says, "When I start on a painting, first I empty my mind of all images. They dissolve into primordial space. Only emptiness, I feel, should communicate with emptiness of the canvas." Despite the fact that he lives in Northern Europe, his work is distinctly Indian. His colors are luminous—Sindoori reds, peacock blues, intense oranges, along with blacks and grays. A rigorous Scandinavian aesthetic distills these Indian colors. The luminous monochrome surfaces of his paintings are repeatedly incised and punctured in an orderly manner, which creates a strict structure. The art critic Donald Kuspit has said: "Using abstraction to convey transcendence, he is the pre-eminent aesthetic mystic of modernism." Sohan Qadri has interacted with a wide array of cultural figures over his long career, including the Surrealist painter Renee Magritte, the architect Le Corbusier, and Nobel Laureate Heinrich Boll, who became one of his most important proponents. Qadri has had more than 50 exhibitions across the United States, Europe, Asia, and Africa.